The decision to have a joint replacement procedure typically comes only after all other options have been exhausted. The surgeon will take into account your age, health profile, and desired activity level when considering a joint replacement. If you are unsure about having joint replacement surgery, call McNeil Orthopedics for a second opinion. McNeil Orthopedics offers replacement options of the shoulders, hips, and knees. Advancements in modern surgical techniques have made joint replacement less invasive and more successful than ever before. This technology makes replacement surgery much safer and faster, with a quicker recovery and fewer complications. We also perform same-day outpatient joint replacement, an option that is becoming increasingly popular. Dr. McNeil or Dr. McGonigle will let you know if you are a candidate for this procedure. 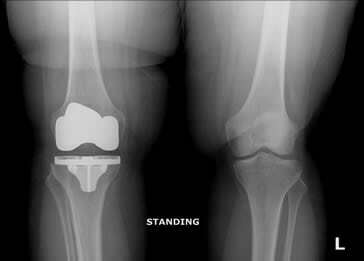 A total knee replacement, or knee arthroplasty, replaces the entire knee joint with artificial parts to help relieve pain and improve mobility. It may be recommended if your knee is severely damaged by osteoarthritis or injury. A total knee replacement involves replacing all three of its compartments: the inside (medial compartment), outside (lateral compartment), and under the kneecap (patellofemoral/anterior compartment). It may be performed as a traditional, open surgery with a large incision, or in a less invasive manner involving smaller incisions and less trauma to surrounding muscles and tissue. Prosthetic knee joints are expected to last 20 years or more. If only part of the knee joint is damaged, then only that part is replaced with a prosthetic in a surgical procedure called a partial knee replacement. Healthy bone, cartilage, and ligaments are left in place. A partial or “unicompartmental” knee replacement minimizes trauma to the knee, resulting in a faster recovery and less post-op pain than is experienced with a total knee replacement. This procedure may be recommended when osteoarthritis or other damage is restricted to a particular compartment of the knee. A total hip replacement, or hip arthroplasty, surgically replaces damaged bone and cartilage with an artificial joint. Injury due to osteoarthritis, rheumatoid arthritis, and trauma (such as from a fall) are common reasons for a total hip replacement. During the surgery, the ball at the top of the thighbone (femur) and the socket in the pelvic bone are replaced with prosthetic parts. Surgical screws or cement may be used to hold the components in place. The procedure may be conducted through a traditional (“open”) surgery or a minimally invasive procedure in which one or two smaller incisions are used to minimize the disruption of muscles and other tissues, as well as reduce pain. A total shoulder replacement, or shoulder arthroplasty, replaces the damaged ball-and-socket joint of the shoulder with artificial components. The damaged ball atop the arm bone (humerus) and socket of the shoulder blade (scapula) are replaced with prosthetic parts. Degenerative joint diseases, fractures, and rotator cuff tears may lead to the need for a total shoulder replacement. Just as its name implies, a reverse shoulder replacement surgery involves replacing a damaged shoulder joint with a prosthesis – although the ball and socket positions are reversed. That is, the ball atop the arm bone (humerus) is replaced with an artificial socket, and the socket of the shoulder blade (scapula) is replaced with an artificial ball. This allows the deltoid muscles to operate arm movement, rather than the rotator cuff. This type of surgery may be recommended in cases where damage to the muscles and tendons of the rotator cuff are severe. After joint replacement surgery, many patients return to normal activity within 6-8 weeks of surgery. If you’ve reached a point when surgery may be necessary, please see us for an evaluation of your joint health. Contact McNeil Orthopedics in North Easton, Massachusetts, today to schedule an appointment with either Dr. McNeil or Dr. McGonigle. Call (508) 205-9630 or you can request an appointment online at your convenience.